Tim Fay welcomed us into his shop in Anamosa, IA where he prints the Wapsipinicon Almanac. He’s been producing this 160-page, letterpress-printed publication featuring essays, fiction, and reviews since 1988. Before we arrived, Fay was working on the 25th and final volume of the Almanac (published bi-annually in the 1990s). While he plans to continue printing under the Route 3 name, as he’s done since 1977, from here on he’ll focus on smaller projects. The printshop, attached to the back of Fay’s house, which he built on his family’s farm, is packed with antique equipment, much of it acquired from a local monastery. 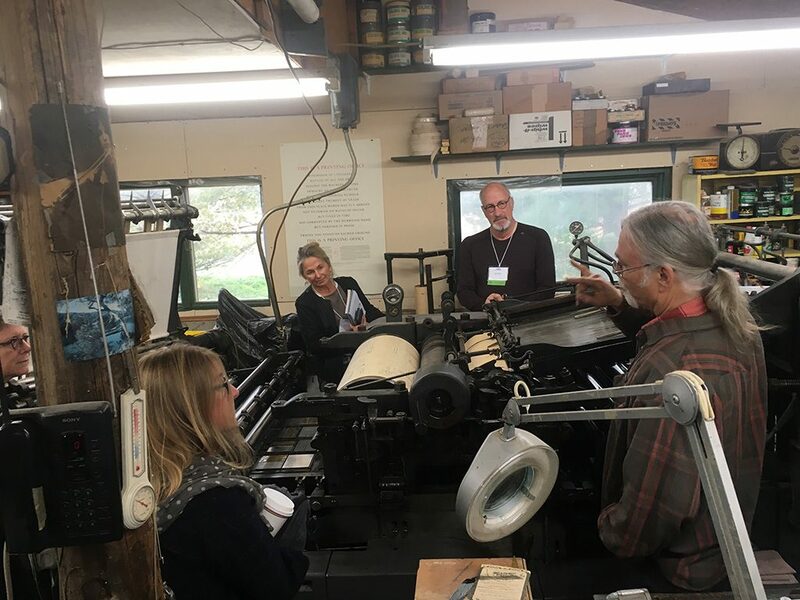 Our tour group watched Fay demonstrate setting and casting type on his Model 8 Linotype, and afterward the operation of his 21 × 28 Miller 2-color flatbed-cylinder press. According to Fay, it’s a rare machine. The only other one he knows of is at Arion Press in San Francisco. 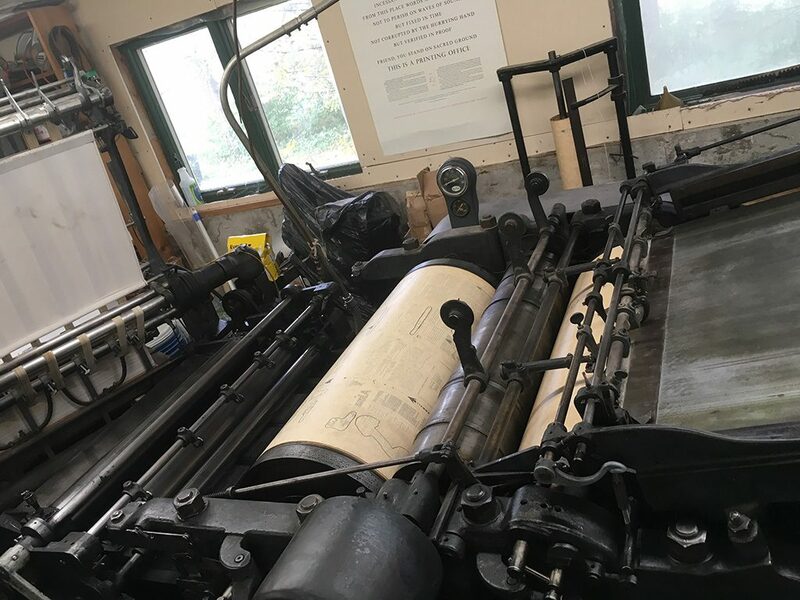 Other equipment housed at Route 3 Press include an old style 10 × 15 Chandler & Price platen press, a V-45 Miehle Vertical cylinder production press, and a Challenge 15 MA flatbed-cylinder proof press, as well as a guillotine and a folding machine—all of them in top working condition. 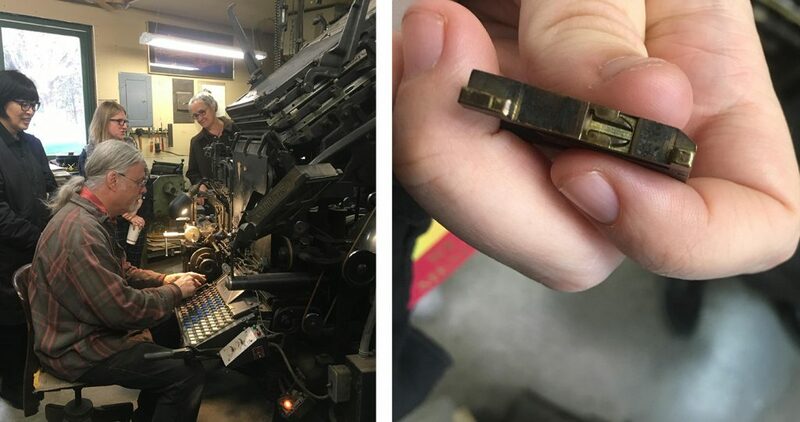 Fay mentioned that when troubleshooting the Linotype he confers with a local, former linecasting operator. With operator manuals close at hand, he emphasized the importance of having an informed relationship with ones’s equipment and treating them with care. Thanks for posting. Tim is living the dream that most of us have passed up. Non avrei mai creduto che negli USA ci fossero ancora in funzione simili attrezzature. Le faccio i miei complimenti. Ma… cosa stampate? Dove vi procurate il lavoro? Come fate a sopravvivere in questa epoca tecnologica? Avete dei sovvenzioni statali? Come i musei? Grazie e vi incoraggio a continuare, “per non dimenticare”! I would never have believed that similar equipment was still operating in the US. I congratulate you. But … what do you print? Where do you get the job? How do you survive in this technological age? Do you have state subsidies? Like the museums? Thank you and I encourage you to continue, “not to forget”! Isabella Myers has a BFA from the School of the Art Institute of Chicago in Printmaking. She is an MFA candidate at the University of Iowa Center for the Book and resides in Iowa City, IA.